Just about six months into its operations, and the Hambantota port is gearing up to become the No. 1 port in the region. A combination of factors, carefully designed and put together is set to propel this port to the top slot in the maritime world map; a place well deserved considering the port’s unique location. The port will take full advantage of its location; with a plan to attract and service ships which are not currently calling in Sri Lanka. This means providing off port services including the supply of ship stores, provisions, and facilitating crew changes, etc., Hambantota International Port Group (HIPG) COO says Tissa Wickramasinghe. 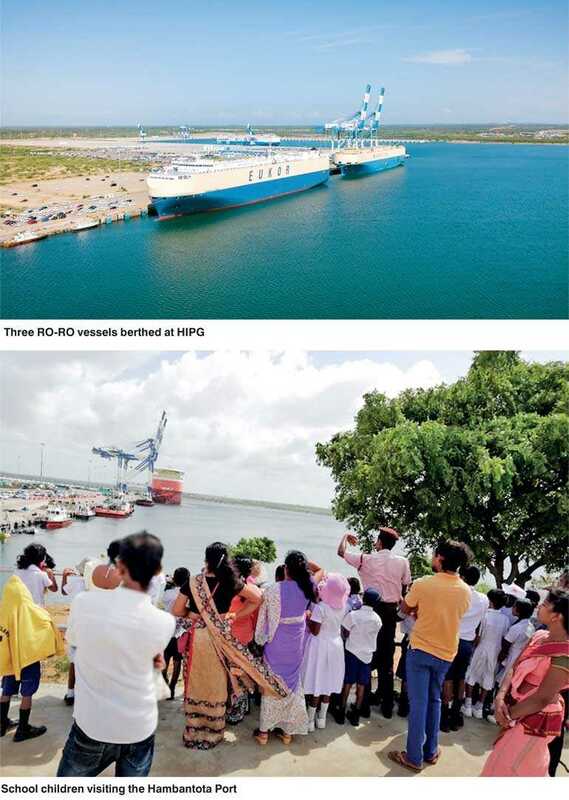 By implementing this Ship Supply Services at off port limits of Hambantota, the port also intends handling the refuelling of vessels while they are on the move on the sea lanes. All of these service are being introduced in planned phases and the port has already commissioned Atkins Limited a firm specialised in designing globally renowned ports, to fast track the masterplan of the port. Soon after they took over, HIPG began Dry Bulk/Break Bulk operations in the port, whereas previously the port handled only RORO operations. Another important change that took place was the considerable increase in RORO volumes under HIPG management. In the first half of 2018 alone, HIPG handled 106,135 vehicles and 153 ships, whist showing a year on year growth of 85% and 17% respectively. The company has also installed CCTV systems to increase security in the port especially to ensure the safety of valuable cargo such as vehicles that are being handled at the Hambantota port. The secure systems in place, have brought down pilferage to zero and a system to lodge formal complaints in the event of any missing items or parts in vehicles has also been implemented. In the case of missing items, the company has established a compensation scheme against losses, provided there is actual proof that items are missing. At the time HIPG took over the port, wharf clerks who entered the port for vehicle clearance did not have proper facilities, which the company took immediate steps to remedy, installing air-conditioned rest areas with washroom facilities. Vehicle clearance procedures have also been streamlined to provide a more efficient service overall. Other facilities the Hambantota port would offer includes bonded warehousing for related businesses, ship repairs/urgent ship services inside the port by providing sheltered piers for the vessels and bunkering which would be ready to commence by the end of 2018. The port has already invested in two modern bunker barges to develop this business. HIPG under their ‘Energy Hub’ concept, has plans to develop and increase facilities for LPG handling, for which they intend partnering with companies such as Litro and Laugfs gas. Tissa Wickramasinghe says this will vastly benefit LPG users in the country and also enable the port to be a distributor of LPG to the region. The proposed LNG plant will provide leadership for the whole region to support the IMO 2020 rule of limiting global sulphur emissions for marine fuels up to 0.5% by 2020. HIPG has just implemented a Bulk Terminal Operating System (BTOS), in the Hambantota port to further improve service levels and efficiency which has brought system to the port’s operation process. A first for Sri Lanka, the implementation of BTOS will ensure accurate information flow, do away with manual documentation through e-data exchange, reduce manual work for agents involved in RORO and bulk operations, ensure smooth operation and quick turnaround of vessels, real time updating of operations, details and monitoring enable customers to extract necessary details of operations and cargo status, and help prevent invoicing omission due to un-recorded miscellaneous operations. There would be shorter waiting time, better transaction/operation status tracking and the Port will provide web inquiry interface to customers to check their vehicle’s status online i.e. information on the discharged or delivered date, when demurrage would apply, etc.